On Tuesday July 23rd at approximately 8:51 pm, State Police Troop T from SP Tarrytown received a report of a vehicle going the wrong way on I-87’s north lane of the Tappan Zee Bridge. Seconds later, State Police received a report of a multiple vehicle rollover accident with serious injuries and entrapment. 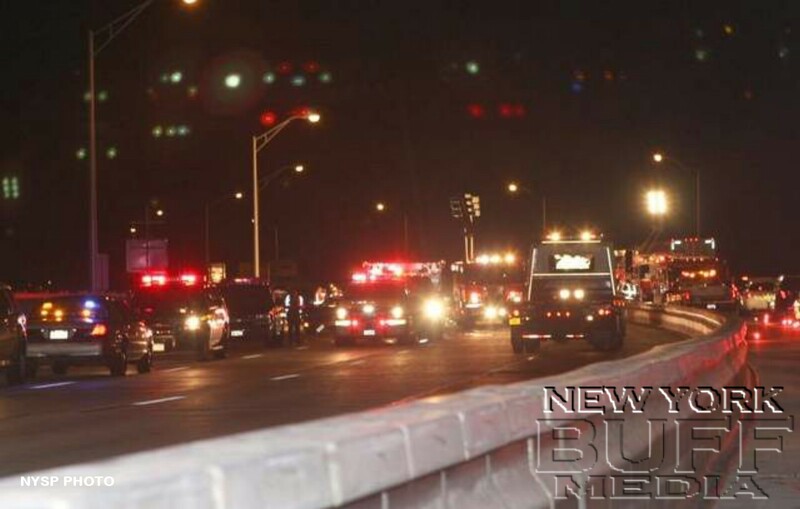 The accident investigation conducted by the State Police revealed that Michael Schechel, age 69, from Thiells, NY, was driving a white SUV south bound in the north bound lane on the Rockland County side of the Tappan Zee Bridge. His vehicle slammed head on into a Nissan operated by Newman Ayeh-Brachie, age 57, from Hillcrest, NY, causing it to roll over multiple times before coming to rest on it’s roof in the middle lane. Schechel suffered a head injury and was transported to Nyack Hospital. Schechel's passenger, Luz Hoffman, age 56, was transported to Westchester Medical Center with unknown injuries. Newman Ayeh-Brachie was also transported to Westchester Medical Center with unknown injuries. A third vehicle, operated by Juan Robles, age 34, from Bronx, NY, also traveling north, was able to swerve and miss Schechel’s vehicle, but then hits Ayeh-Brachie’s vehicle before coming to rest. Robles was uninjured. A fourth vehicle, operated by Nancy Gallo, age 44, from Basking Ridge, NJ, was traveling north as well and as she approached the lane blockage, Gallo was able to avoid striking Schechel’s vehicle, but then rear ends Robles’ vehicle before coming to rest. Gallo was transported to Westchester Medical Center due to neck pain and shock. A fifth vehicle, driven by Thomas Gibson, age 40, from Poughkeepsie, NY, then sideswipes Schechel’s vehicle and comes to rest. Gibson was traveling with his 10 year old son and both were uninjured. A passenger of Ayeh-Brachie’s vehicle, Hannah Ayeh-Brachie, age 56, from Hillcrest, NY, was pronounced deceased at the scene by the Rockland County Medical Examiner. New York State Police Bureau of Criminal Investigation and New York State Police Collision Reconstruction Units responded to process the scene. During the investigation, the New York State Thruway Authority together with the State Police activated a traffic diversion plan where all north bound traffic was directed off I-87 at exit 9 which kept any backups to a minimum. Coordinated efforts of the Troopers on scene alleviated any vehicles stuck in traffic on the bridge, which prevented any further property damage or injuries. At this time, no arrests have been made and the accident is still under investigation. All lanes of the Tappan Zee Bridge are open to traffic.